‘Khamma Ghadi’, this is the statement I was welcomed with while commencing my expedition to the Land of Warriors- Rajasthan. The ‘Jewel in the India’s crown’ is no less than a satisfaction for every globetrotter present here. The place has proved to be a heartthrob for me and till now I am unable to get over the memories perceived from this beguiling destination. Not only Rajasthan, but my tour with Max Holidays has proved to be a fruitful showcase of the three delights in the Golden Triangle, i.e. Delhi, Rajasthan and Agra. Undoubtedly, being indulged in a Group Tour and that too for the first time made me very nervous in the beginning but anyhow, I tried to manage and move on with my expedition. To be true, I must say- ‘Group Tours are amazing. They are the best things which a traveller can ever experience’. Making new friends, having a number of guides by your side, gaining a whole new experience, learning to see the sites with a brand new perspective and also be sure about the safety at all the places you are travelling in- Group Tours are simply in trend nowadays. The starting as well as the ending point of my journey- Delhi has never failed to leave me awestruck by its winsome beauty and vibrant nightlife. While being here- I came across a bundle of experiences paving a way to abundant memories for the lifetime. Mentioning my most favoured activities here, I would like to talk about the Rickshaw Ride in the squeaky lanes of Old Delhi, Metro Ride done with the sole intention of reaching Old Delhi in a rather locale way, consuming the street food with my newly made friends of my troop, Bangla Saheb Gurudwara as well as the Qutub Minar. My group was stunned to see the delightful aura of the capital city and were not at all ready to leave this ravishing hub, however since we had to head towards our next stop- it was the time to say goodbye to my favourite Delhi! Rajasthan was surely going to be our next stop during our Group Tour in India and it was no less than a satisfaction for us. Heading towards Mandawa from Delhi and then exploring the hidden treasures of the varied tourists’ hubs in Rajasthan including Bikaner, Jaisalmer, Jodhpur, Udaipur, Pushkar and Jaipur just acted as a sheath for letting me intrigue in the majestic forts and palaces of the cities. Commencing right from the Mandawa’s prolifically painted walls and buildings while passing amidst the Bikaner’s Junagarh Fort, Camel Breeding Farms, Jaisalmer’s Golden Sand Dunes, Havelis, the blue city Jodhpur’s old town- Osian, Jain Temples, Udaipur’s Vintage Car Museum, boat trips, the mighty Pushkar fair and ending at the Pink City Jaipur- our Group Tour in Rajasthan came to a fruitful conclusion. For me, Rajasthan has proved to be a ‘fairy-tale’ that exists in reality. The forts standing on the mountains still signifying the bravery of the Emperors are surely going to take you back to the bygone era. After getting over with the fun I and my group mates attained from the Land of Warriors, it was the time for us to move forward to our last destination- Agra. 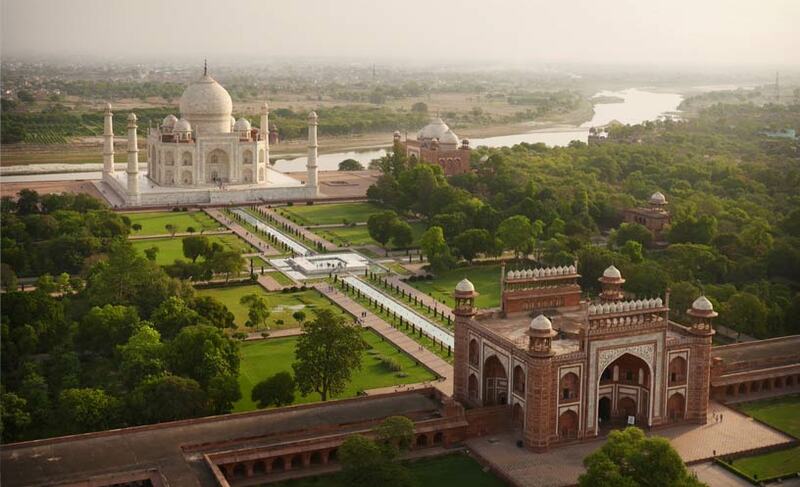 A habitat to one of the Seven Wonders of the World-the majestic Taj Mahal, this place is at its vibrant best. A symbol of love, purity and bravery this iconic monument is continually serving as a true epitome of beauty from thousands of years. I have heard about the Taj many times but never perceived an opportunity to explore this splendid fort and finally getting a chance to see it in front of my eyes….. I was speechless! Its fascinating tombs and mausoleums, lively market areas and historical relevance facilitated me with a super-amazing ending to my trip. The royal culinary experience witnessed by the beautiful city of Agra is more than sufficient to persuade me for planning a trip to this place yet again. India is a beautiful country, we have always heard about it but getting an opportunity to see it live from our eyes was a totally different experience. I had a dire need of diving into the diverse culture and beauty of this country, and am sure that nothing’s best than the Majestic Forts & Palaces Tour Package with Max Holidays. Being engrossed in the group tours, this journey has inculcated a sense of belongingness in me that is never going to end now. A fruitful expedition with an array of new friends- this was my whole new experience.